1 For the risotto: cut the peeled pumpkin in half. Dice one half into 1cm cubes and fry in a third of the butter until soft. Remove and set aside. Thinly chop the other half and add to the hot pan with another third of the butter and 75ml water. Place a lid on the pan and cook until extremely tender. Put the soft pumpkin in a blender and purée until silky smooth. 2 Add the remaining butter to a warm pan then add the onions and garlic. Sweat until soft, but not coloured. Add the sage, rosemary, and salt to taste. Pour in the rice, stirring constantly over medium heat, until the rice is translucent. Season the rice with a little salt and pepper. Add the white wine while stirring until it is absorbed. the risotto a nice orange colour, all the while stirring. 4 Add the Parmigiano Reggiano and lemon juice. Ensure the rice is cooked properly, with a little bite, and add more stock if required. 5 Remove the risotto from the hob and let stand for 5 minutes, with the lid on. This helps all the ingredients bind to ensure a rich, creamy risotto. Adjust again with more stock if required, making sure to stir the rice. Add salt and pepper to taste. 6 For the monkfish: heat a large, heavy-bottomed pan. Add a generous amount of vegetable oil. Put the monkfish pieces into the pan and season with salt. Fry for 1 minute then put the pan into a preheated oven at 200°C, gas mark 6 for 3-4 minutes. 7 Meanwhile, to make the garnish, in another pan melt 50g of butter and keep cooking it, continuously whisking, until it turns lightly brown in colour. When brown, add the lemon juice immediately to stop it cooking. While the butter is still warm, add the sage and toasted pine nuts then season with salt to taste. 8 Remove the monkfish pan from the oven. Turn the fish over and add the butter and the dried mushroom powder. Baste the fish for 1 minute then remove the monkfish from the pan and leave somewhere warm to rest for 2 minutes. 9 Heat some vegetable oil in a large frying pan and add the mushrooms. Fry over a medium heat for 1 minute. Then add the butter and a generous pinch of salt. Cook for 30 seconds and remove from the pan. 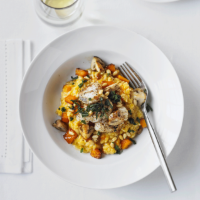 10 To serve: spoon the risotto into a large serving dish. Scatter over the monkfish pieces and mushrooms. Spoon over the sage and pine nut butter.